There was hardly an empty spot on Main Street as the cheering crowds enjoyed the 4th of July parade celebrating our American heritage. As each float and decorated vehicle passed, the kids quickly scrambled forward to retrieve the candy being tossed to the crowd. Though all parade entries were special and appreciated for their participation, there were two that had an extra special significance. 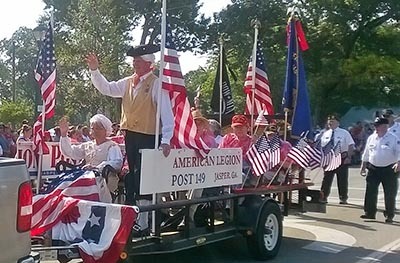 American Legion Post 149 reached out to the Pickens County Senior Center and joined forces to create their float named "Founding Fathers". Both groups were very proud of winning Second Place for Best Float. Waving to the crowds was many of Pickens seniors and a couple of "really old citizens" Betsy Ross who designed our first flag and President George Washington. Our celebrities were played by Legion wife Sue Wheeler and legion member Steve Hammer. Senior vice Commander, Rick Rice stated that they had visited the center after hearing 8 veterans are regular participants. "We went to invite them to some of our activities", spoke Rice. "When we found out the Center was looking for ways to have more community involvement, it was a natural for us to work together." Senior Center Director Kimberly Bolt was very happy with the arrangement. "Our seniors have shown a lot of excitement in our preparations," she said. The group made patriotic tie dyed t-shirts to wear and assisted the legion in decorating the trailer. In the 3 years Bolt has been here, this is the first time they were able to be involved in the parade. Forty of the 83 senior members participated in the parade. "We had to get a second trailer and two big golf carts to seat everyone”, explained Bolt. “A big thanks to Piedmont Mountainside and Lions Club member Ray Ferrell for making the add-ons possible." In addition to the floats, several legion members walked and rode motorcycles. "This was a great event”, spoke Rice. "We will definitely be joining together again next year."